Rod Serling is rightly regarded as one of the true giants of television, a genius who conceived, innovated, and earned respect for a whole new type and genre of American entertainment. There are few people today who don't cherish the classic television show he created and the legacy he left behind. But in the early days, it seems, not everyone had the same positive view of the somewhat enigmatic Mr. Sterling. Vance: Oh no, Zane! We're just trying to sit in peace here in the CBS Commissary and grab a late afternoon snack and look who's coming! Zane: Oddball Serling? Well, what can you do? Rod: One Zane Bernstein. His close associate Mr. Vance Koslow. Submitted for your approval: May I sit with you guys? Vance: Umm ... sure, Rod. What've you been up to? Rod: A journey into a wondrous land whose boundaries are that of the imagination. Cleveland. For the weekend. With the missus. Vance: Sounds ... uh ... really fun. Okay, let's order, guys. Gail, we're ready! Gail: What'll you fellas have? Rod: You're here To Serve Man? Gail: And women too sometimes, Mr. Serling. Vance: I really like the food here. Wonder where they get their recipes from? Gail: And we always use ample seasoning in all our food. Rod: Yes. Thyme Enough at Last. Zane: Rod, see those two women hobnobbing and stopping at every table? You know them, right? Now they're coming over here! Rod: Next stop? Willow, Bea? Bea: Nice to see you, Rod. Love to talk, but Willow and I have to go. Later! Zane: I think one of your friends was checking me out, Rod. The one who I believe keeps bees? Rod: Yes, you caught The Eye of the Bee-holder. Rod: There's the signpost up ahead! Zane: So, "Mr. Professor," I hear you're working on some kind of science fiction show. School us about it. Zane: What's your rush? At least tell us the name of the show. Rod: It's already Twilight, Zane! Vance: He's gone! Boy, that is one weird dude! He's never gonna make it in show business. Zane: Damn straight! The day he makes it, Vance, I'll believe in time travel, gremlins wrecking airplanes, and that William Shatner guy ever amounting to anything! * This phrase is heard at the end of The Eye of the Beholder and several other episodes. If you liked this post, you'll like my book Perry Block - Nouveau Old, Formerly Cute. If you hated this post, then you don't deserve the Twilight Zone! But you probably still deserve me, so you should still buy my book! Not much you can do about difficult support personnel. You just have to sit back and say "it's a good thing you did. I'm glad you gave me bad advice. And tomorrow's gonna be a real good day!" So glad Mr. Serling did not listen to the naysayers. Yep, good thing he told them to keep their Walking Distance! Okay, that's the last one. Thanks for your comment, Darrelyn. Life would not have been the same without Rod, chances are I may have grown-up......"shutter"....NORMAL. Ugh! Somehow, Elizabeth, I doubt you ever would have grown up normal! I mean that with love. Thanks for joining the blog! I loved the Twilight Zone. I love your take on it as well. Loved Twilight Zone and still watch it, thanks to Netflix. 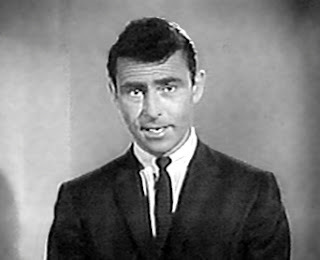 Rod Serling was born in my hometown of Syracuse, NY so I have a special fondness for him. Only you could write a post like this, Perry! Loved it! Love that little dig at Captain Kirk. Funny, I think his acting was halfway decent back in The Twilight Zone days. Or maybe he just had better material. Yes, I was so young I was actually in minus years! Ask Mr. Serling how that works. Thanks, Richard. Oh, no! You were eaten by a giant alien? Richard, I read your piece and did not recognize it as a Twilight Zone episode. Turns out it was Night Gallery. It was written by Rod Serling, though, so just as good! What a fun read and such clever wordplay! I kept wondering where you were going by naming the character Zane. Perfect! Thanks, Stephanie! It's always fun to meet another humorist. Going to check out your work soon. L'chaim!